Cast: Owen Wilson, Vince Vaughn, Rachel McAdams, Isla Fisher, Christopher Walken, Jane Seymour, Will Ferrell. Story: Two lawyers spend their summer crashing weddings to meet women. Cards on the table from the off - Wedding Crashers isn't a very good movie, but it raises a chuckle here and there so is worth a couple of hours of your time. In terms of wedding guests, it's the table-hopping magician who keeps you from wondering when the next course is going to turn up. The story's unoriginal, but at least the setting is fresh. Owen Wilson and Vince Vaughn like to gatecrash their way into summer weddings for the free food and loose women. When crashing one particularly high society do, Wilson falls in love and ... well, you know the rest. The setting is pretty amusing and there are many funny lines, but there's nothing to have you rolling in the aisles. Most of the humour is of the non-PC they're-such-rogues type, which will leave some people cold, but if you've enjoyed Wilson's previous efforts (Starsky & Hutch, I Spy, Shanghai Knights) then you'll have no problem buying into this. However, if you particularly dislike either of the leads then stay well away because you'll need to be on their side to laugh with them. The two hours seemed to go fast, but I can imagine that if you're not in the frame of mind, it could drag like a dog with no legs. Owen Wilson's a naturally funny guy, whereas Vince Vaughn has to work at it. Sometimes it works, such as in Dodgeball, sometimes it's less successful, such as in Be Cool. Here he falls part-way between the two and he oddly looks 4 inches taller and 5 stone heavier than usual, but it's clearly Wilson who is the more screen-friendly. Isla Fisher, who the sadder acts among us may remember as Shannon from Home and Away, or from Scooby-Doo, makes a good scary clinger and Rachel McAdams shares her infectious smile nicely. Christopher Walken, sadly, seems to be making some peculiar career choices recently (Man on Fire) and didn't seem to give his all to the big-shot protective Dad role. Best of all was Will Ferrell, in a relatively short but hugely silly and naughty routine towards the end. His big scene felt like it was written by someone else specifically for him, it was much edgier, with a real I-shouldn't-be-laughing-at-this feel to it. 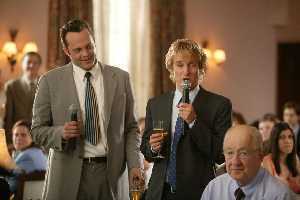 Wedding Crashers is a desperately shallow, but nonetheless rather amusing comedy. It's best enjoyed after a few beers and with some friends who are in a silly mood. More enjoyable than a church service and dancing with your grandma, but not as fun as wall-to-wall crab cakes and a free bar. Testosterone Satisfaction Rating: 2/5 Some anonymous boobies and a body double for Isla Fisher. To enjoy this film you should: chuckle at the non-PC bits. Wedding Crashers is on general release in the UK now.